On Sunday July 31st, we are screening the Whitecaps FC vs FC Dallas game, with refreshments and non-alcoholic beverages on hand at Murphy Battista’s Personal Injury Resource Centre (PIRC). Hosted by Kyle Gieni, one of PIRC’s newest Resource Coordinators. Feel free to stop by, relax, and enjoy the soccer game with friends. Our staff at PIRC have an understanding of the recovery process after enduring serious injuries themselves. With the help of lawyers from our firm, they can provide free legal advice as well as support to personal injury victims and their families. By hosting this game day screening, we hope to inject some fun and excitement while helping you navigate the road through recovery and personal injury. Entertainment on the day will include watching Kyle featured on Bell Outside the Box with professional soccer player, Jordan Harvey. Watch as Kyle and the iCord team help Jordan learn about spinal cord injury research and try out wheelchairs and iCords exoskeleton. What an amazing 15 minutes of fame for Kyle! This is our opportunity to build community spirit, provide an enjoyable experience, and support individuals affected by disability as well as share their personal injury stories. Our staff will also be on hand if you have any questions about how to get legal advice, or if you’re curious about what else the Personal Injury Resource Centre offers. 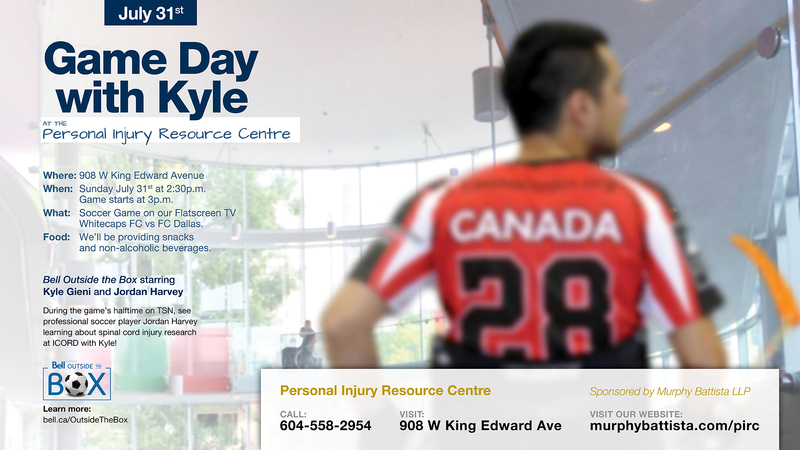 To learn about our Personal Injury Resource Centre, click here.